In the arena of music-making (excuse the gladiator framing), where judges, who might occasionally doze off through arduous rounds of performances can be blamed for a bad call as they eliminate favorites (for some listeners) while passing through others, we still want to believe that ARTISTRY will reign as the biggest consideration in the adjudication process. For me, the spread of players at Tchaikovsky XV offered various styles of playing, with consistency of high-level music-making not always manifest, yet the subjective side of reviewing a performance by a so-called skilled adjudicator, or a sophisticated listener, or less musically informed audience member (LIVE or by Internet) is just as valid, since ART unlike SPORTS has no intrinsic need for CONTENDERS to vie for an OLYMPIC wreath. In short, the Masterworks and their divinely inspired creators acquired a new stature amidst a feverish international SPORTS frenzy! (Soccer anyone, on ESPN?) No thanks we had the war horse concertos beamed through a select group of young performers–one, like a young Stallion (Kharitonov), catapulted himself to favored status with his Lisztian lyricism while Dmitry Masleev landed a second round prize for his rather mature rendition of Mozart’s D minor concerto. In the last grueling lap he nailed the Gold! Without a doubt, the powerful EXPOSURE, Silver medalist, George Li received at the Competition was worth its weight in Gold. Obviously listeners far and wide should trust their innate assessment of beauty and artistry without having to apologize for a variety of aesthetic preferences. And at the same time, they shouldn’t be wooed to a Moscow talent showcase with the incentive of a declared Grand Prix winner in the spirit of a Nascar finale. From my perspective, the Tchaikovsky Competition that culminated in the purple-tinged GALA awards ceremony with its crescendo to the PRIX was not about the essence of MUSIC-making. Even its wrap-up had contestants tied for Bronze or Silver prizes while off the competitive stage, a pianist named Debargue captured a wreath from the Moscow Music Critics Association. He otherwise trailed off to fourth in the official standings. Not much of a horse race. All kidding aside, perhaps my UTOPIAN wish would be that a global audience of listeners could be drawn to an international showcase of musical talent without the incentive of a fever pitch march to the WINNER’s circle. To this effect, a cadre of UTOPIANS, including Seymour Bernstein have been clamoring for a new framing that would preclude putting music-making into a competitive category. 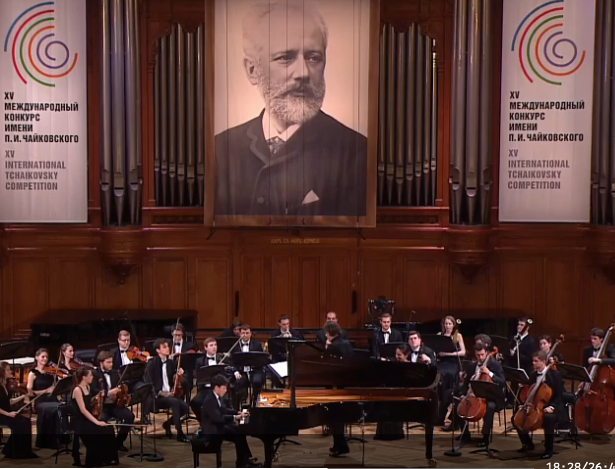 Still, for now, the big Tchaikovsky Competition, occurring in 4 year cycles, is here to stay with a new INTERNET-driven, LIVE-STREAMED boost. For this alone, we should be grateful! I prize – Dmitry Masleev (Russia); II prize – Lukas Geniušas (Lithuania-Russia), George Li (U.S.); III prize – Sergei Redkin (Russia), Daniel Kharitonov (Russia); IV prize – Lucas Debargue (France). I prize – no winner; II prize – Yu-Chien Tseng (Taiwan); III prize – Haik Kazazyan (Russia), Alexandra Conunova (Moldova), Pavel Milyukov (Russia); IV prize: Clara-Jumi Kang (Germany); V prize: Bomsori Kim (South Korea). I prize – Andrei Ioniță (Romania); II prize – Alexander Ramm (Russia); III prize – Alexander Buzlov (Russia); IV prize – Pablo Ferrández (Spain); V prize – Seung Min Kang (South Korea); VI prize – Jonathan Roozeman (Netherlands). Male: I prize – Ariunbaatar Ganbaatar (Mongolia); II prize – Chuanyue Wang (China); III prize – Hansung Yoo (South Korea); IV prize – Dmitry Grigoriev (Russia). So proud of George and I am not even one you yanks. He produced some truly amazing performances and, as you mention, it is all abit subjective so this second will certainly propel his career along very nicely thank you! Yes, I’m with you on George’s ascending career and Medici TV gave his concert profile a big boost!